Guys, if you know me you know how much I love carbs and especially cheese! I get both through one of my favourite things – PIZZA!! Of course, I can’t carb out every single day so when I came across CAULIPOWER (cauliflower pizza crust) you can only imagine how elated I was – now I can have my pizza (totally guilt free) and still allllll the flava! Bonus, I don’t have to run extra on the treadmill. Basically, have your pizza and feel good too! Can I get a woot woot?? Once I grabbed some of the cauliflower pizza crusts from my local grocery store, I tested those babies out…. starting on Friday night. I piled the crust really high with some of our favourite toppings. I followed the baking instructions (on a baking sheet, middle rack, for 12-14 minutes). The result? A perfectly crispy, flavourful crust. Truth talk —>I didn’t know what to expect, didn’t know how the texture would be, how it would taste or how it would bake. My opinion? You could serve this cauliflower pizza crust to anyone and I’m confident they’d love it. Despite putting tons of toppings on there, it baked up crispy and delicious. Would I get it again? You bet! What Makes CAULIPOWER Pizza Crust So Great? It’s the #1 cauliflower pizza crust in the US and now available in Canada (and made in Canada, which I love)! Guess what the first ingredient is? You better believe it – cauliflower! Compared to traditional pizza crust, this low carb pizza crust is chocked full of vitamins, lower in calories and naturally gluten free. You can purchase CAULIPOWER at a variety of major retailers across Canada, like Loblaw’s (Dominion here in Newfoundland), Walmart, Costco, Whole Foods, select Sobeys and many more independent retailers. Find the deliciousness near you via their store locator here. 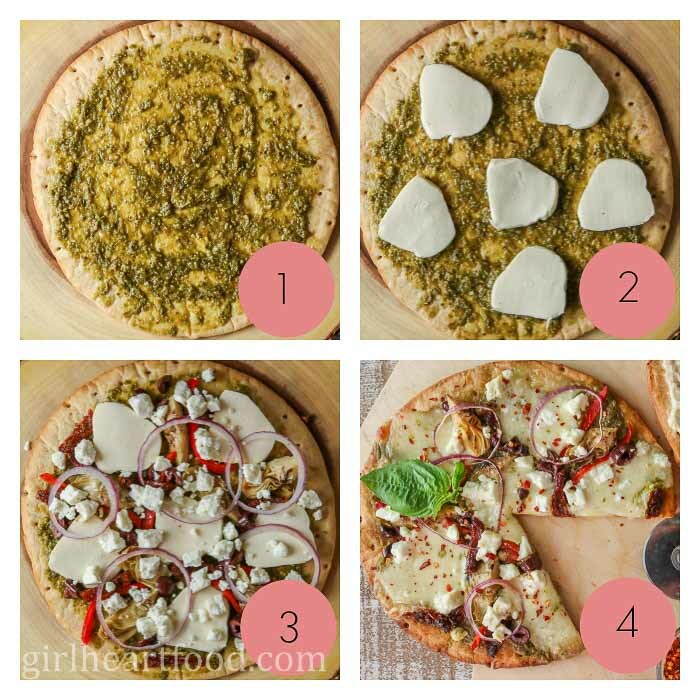 It comes in delicious varieties like Three Cheese, Margherita, Veggie Pizza or Plain Crust (which is what I used today for this Mediterranean pizza). This cauliflower pizza crust is thin crust (my fave), takes minutes to bake, it’s a healthier alternative to traditional pizza crust, it’s crispy and, most importantly, it tastes DELICIOUS! Excited yet? Read more about CAULIPOWER cauliflower pizza crust and their yummy products HERE. To assemble, all ya have to do is top the cauliflower pizza crust with some pesto, both cheeses and remainder of ingredients (except chili flakes). Bake until until crispy and cheese is melty. Once out of the oven sprinkle over chili flakes and dig in! Keep the pizza crust frozen until ready to use. I used sun-dried tomatoes packed in oil (not the dry packed ones) and drained . That’s what I enjoy and recommend. Ensure that your ‘wet’ ingredients like red pepper, olives, sun-dried tomatoes and artichoke are patted dry before adding to the pizza. You want a nice-n-crispy crust! Use as much chili flakes as you like! Like it spicy? Add more. Not into spice? Omit or add less. You do you! Make it your pizza. The quantities of toppings used for this pizza is basically a guide. If you don’t have all of the ingredients on hand or like less (or more) of something, adjust to your tastes. 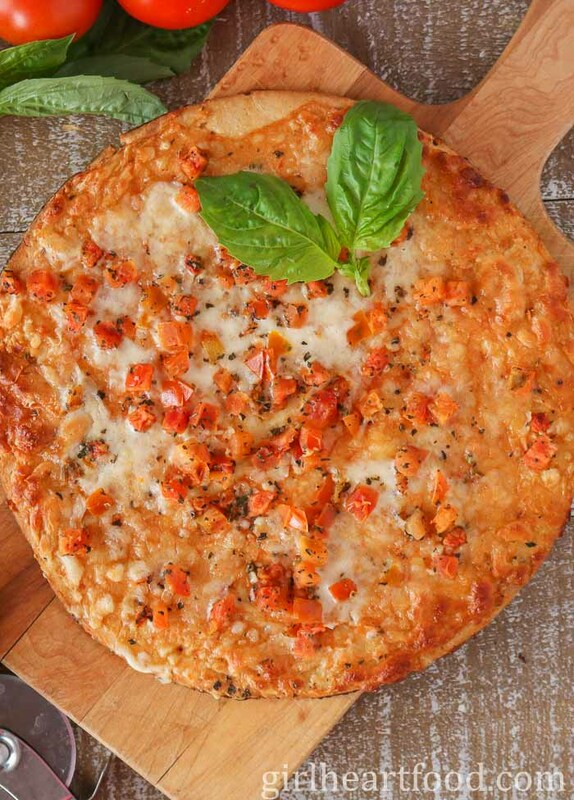 Can’t find the cauliflower pizza crust in your area just yet? Use your favourite pizza crust. If you want to let your imagination go wild, why not create your own pizza using CAULIPOWER cauliflower pizza crust. This baby comes conveniently packaged in a two pack. It’s basically a delicious blank canvas to create any combo you want! Buffalo Chicken Pizza – Another Delicious Option! I spread some ricotta on the cauliflower crust and then topped with the remaining ingredients. It took, like, 2 minutes. Then, I baked the pizza per directions and, once outta the oven, I sprinkled with some green onion and drizzled some of my fave hot sauce on top. So delish! You may just want to give this one a go too. P.S. do you love blue cheese as much as I do? That funk is great! If you aren’t in the mood to whip up your own pie, no worries! As mentioned up top, CAULIPOWER comes in some flavours too. I tried the Margherita variety and just garnished with a little basil. Easy peasy and bakes up in about 12-14 minutes. Since CAULIPOWER is a healthier alternative to traditional pizza, I would eat this for any meal of the day, even breakfast. Can you imagine how yummy this would be for a Saturday brunch with friends? Have a bunch of crusts on hand and make some breakfast themed pizzas. Pssst—> eggs are AWESOME on pizza! CAULIPOWER is delicious pizza that loves you back. Totally worth trying out. Hope you love these easy cauliflower pizza recipes as much as I do and get a chance to check out CAULIPOWER at your local grocery! Preheat oven to 425 F. Spread pesto over CAULIPOWER cauliflower pizza crust. Top pesto with mozzarella slices. Next, distribute red pepper, olives, sun-dried tomatoes, artichokes and red onion over cheese. Sprinkle with crumbled feta. Bake on a baking sheet on middle rack for 12-14 minutes. Carefully remove from oven, top with chili flakes (if using). Cut and enjoy! I used sun-dried tomatoes packed in oil (not the dry packed ones) and drained . That's what I enjoy and recommend. Ensure that your 'wet' ingredients like red pepper, olives, sun-dried tomatoes and artichoke are patted dry before adding to the pizza. You want a nice-n-crispy crust! The quantities of toppings used for this pizza is basically a guide. If you don't have all of the ingredients on hand or like less (or more) of something, adjust to your tastes. 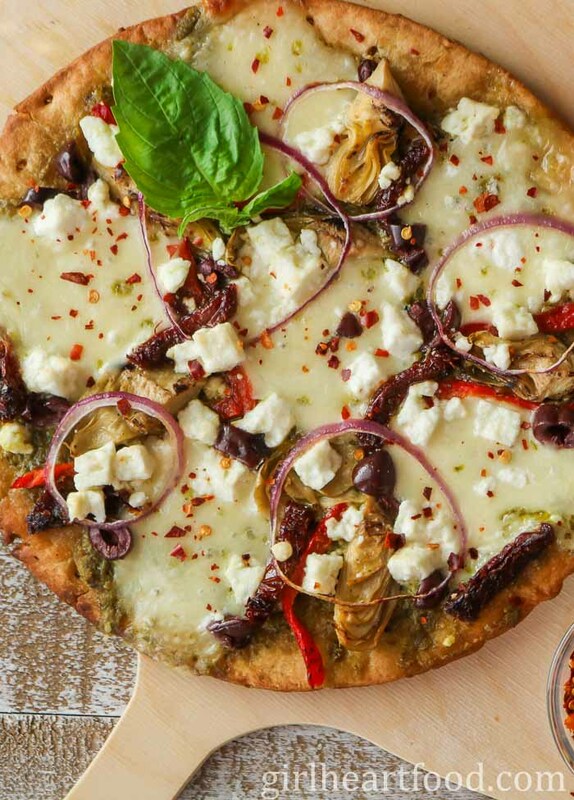 Can't find the cauliflower pizza crust in your area just yet? Use your favourite pizza crust. Love your combination of toppings…they would make me happy. I’m a huge fan of cauliflower pizza crusts! I haven’t made my own yet, because the store bought variety are so darn easy! Love how light and crispy they are, and just perfect for someone cutting back on grains like myself! Love these crusts! The Canada box looks a little different, so cool to follow your shopping experience:). 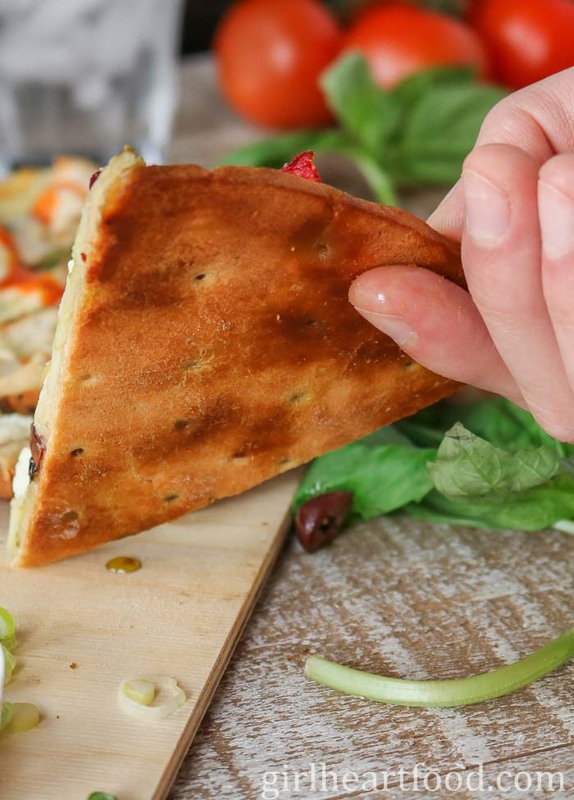 Would love to enjoy the entire Mediterranean pizza you made – absolutely would not share too! Pinned. Great option for low carb! Love all the topping you used to make a tasty dish! YUM! You know how much I love my pizza and wine on the weekends, my friend…I’m going to have to pick up one of these crusts! I can’t believe the bottom looks so crispy!! Love it. My go to pizza toppings are pepperoni, banana pepper and feta cheese. Oh, and ranch dressing. Give it a try! SO GOOD! Dawn! This crust looks amazing- what a good find!! I’m totally gonna look for this- I love pizza but dang, so much bread AND cheese. If I could get rid of the bread I’d eat it more often. That crust looks so crisp on bottom too- I’m gonna try it!! I’ve seen these in the grocery store and wondered about them!! I’m so excited that you did the research for us!! Definitely picking one up next time I’m there! I say go for it because they’re delish 😉 Thanks Marissa! I’m crazy about those caulipower crusts! I even like their frozen pizzas when I’m feeling extra lazy. But this pizza has all my fave things on it (I’m looking at you, artichoke hearts and feta) so I have to try it. SO GOOD! Have a great weekend, Dawn! Woot! Woot! Dawn, this pizza looks fabulous and I just can’t believe that crust! It looks so crispy and so good! I’ve got to find this in the store! Woot Woot Dawn! I NEED that cauli crust. I’m dying to get off the treadmill! Lol! 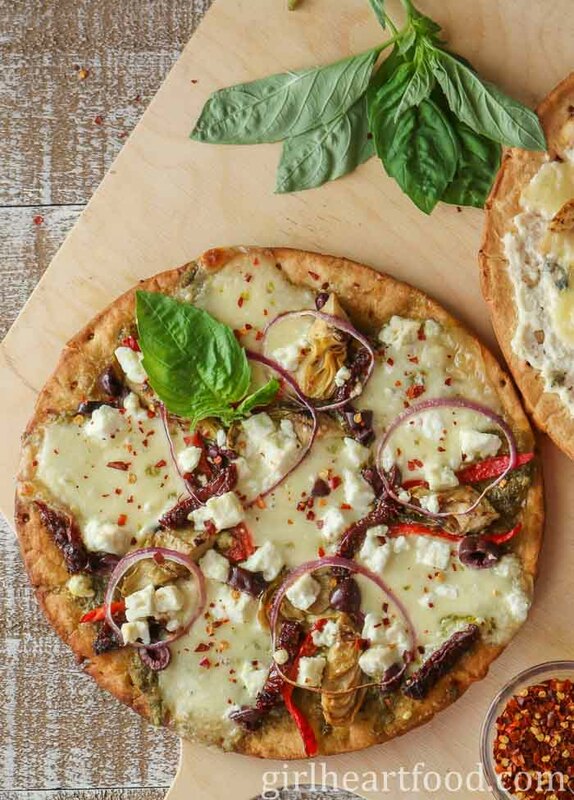 love the Mediterranean flavor of this pie too! Pinned! Haha..I hear ya!! Thank you so much, Mary Ann. While I’m aware of the trend of vegetable-based pizza crusts, I’ve got to admit I’ve never tried one! And this crust looks fantastic indeed – I would have never thought it’s low carb and calories. And these toppings are one of my favourite. Sun-dried tomatoes, pesto, peppers, and mozzarella? I’m in! I need this caulipower pizza crust in my life. A Round of an applause for such a tasty pizza recipe. I could eat that whole pie all on my own! Wow, that looks like one heck of an awesome pizza, Dawn! We were in Canada this past weekend for a curling tournament, and we stopped by the grocery store on the way into town. I was amazed at how similar everything was, yet so different at the same time. Different brands, some of ’em in French, but familiar products. I was like a kid in a candy store! Glad to hear that this cauliflower crust is available in the States…I’ll have to keep an eye out for it. This pizza looks amazing with all of those delicious toppings, too! Thank you David! That’s so funny! Love going to grocery stores when travelling…always try to grab a new find. Hope you get your hands on this crust!! Holy pizza!!! I need me all three of those in my mouth!!! They look so delicious and I’m looking out for the crusts in my stores this weekend. I had no idea you could buy a frozen cauliflower crust! That makes life so easy. This pizza looks extra delicious. This is perfect for lunch, dinner or even a late night snack!